The Doctor in the House is a Homeopath! Among the papers in the Tredwell family archives are notes, copied by a staff member from Seabury Tredwell’s personal ledger, that date from 1851 until his death in 1865. (Unfortunately, the ledger is missing.) Judging by his detailed entries of monthly debits and credits, Seabury kept a tight hold on his family’s purse strings. He carefully included expenses both large and small, such as his pew rental at St. Bartholemew’s Church in 1851 ($300), frequent carriage rentals ($8 average), and 16 hams ($29.25). The most exciting information gleaned from Seabury’s ledger book, however, relates to payments to various physicians for 18 house calls made during those 14 years. Based on standard medical practice of the time, that would have meant a lot of purging and bloodletting. But most likely, not a drop of blood was shed in the Tredwell household in the name of therapy; for in researching the medical practices of the six doctors who ministered to the Tredwell family, it was discovered that, far from being mainstream practitioners, they were all non-traditional homeopaths. 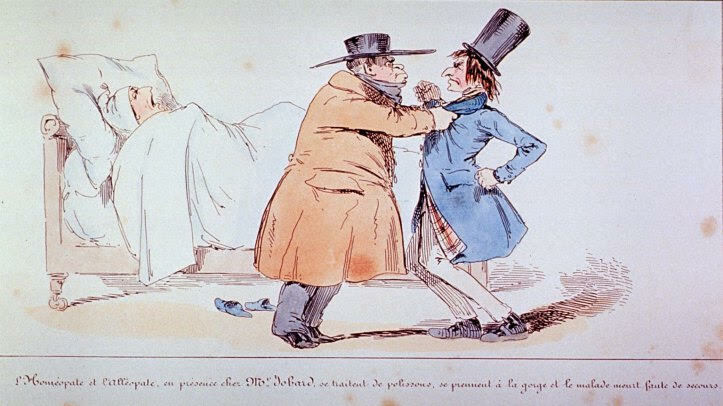 Prior to the development and gradual acceptance of germ theory in the mid-to-late 19th century, summoning one’s physician to treat an illness was risky at best. Orthodox medical practice offered little in the way of treatments, and the choices were harsh, potentially toxic and painful, and largely futile. Mercury, arsenic, and lead were used to elicit violent purging and vomiting; bloodletting and use of leeches caused severe anemia, which only worsened the patient’s condition. As a result, laymen developed a severe distrust of physicians, and expressed their doubts and criticisms publicly. As “regular” physicians (or allopaths) struggled to identify more evidence-based treatment modalities, homeopathy emerged as a sophisticated and gentler alternative to the barbaric practices of regular medicine. 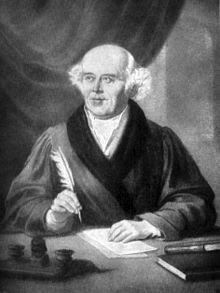 The origin of homeopathy dates to the work of the German physician Samuel Hahnemann (1755-1843). It was introduced in the United States by Hans Burch Gram (1786-1840), who began practicing medicine in New York City in 1825. Treatment was based on the “Laws of Infinitesimal Dose” and the “Law of Similars,” in which minute and extremely diluted doses of medicines were administered to produce symptoms similar to those of the disease being treated, thereby allowing the body to naturally heal. This was perceived as a gentler, more holistic approach to treating disease. The recovery rates of patients treated with homeopathy were higher than those treated by orthodox medicine, simply because the new remedies did little or nothing to harm the patients. The apparent success of this new approach, especially during the cholera epidemic of 1832, led many regular physicians to seriously consider “converting” to more homeopathic remedies. Many of these were physicians who had trained at highly regarded allopathic medical schools. In 1834-1835, both the New York Homoeopathic Society and The American Journal of Homoeopathia were established. By 1844, the number of practicing homeopaths in the United States had grown to such an extent that the American Institute of Homeopathy was formed. In 1860, the Homoeopathic Medical College of New York was opened and by 1900, the city had more than 100 homeopathic hospitals, clinics, and dispensaries, including one on Bond Street, two blocks away from the Tredwells’ home. The number of homeopaths in New York City grew from 93 in 1857 to 322 in 1904, which was over 15 percent of all practicing physicians. Of Wenner and of Wetter. We do not know why or when Seabury Tredwell began to turn to homeopaths for his family’s medical care. There were at least four physicians in his immediate and extended family; although the nature of their practices is unknown, they were most likely allopaths. Seabury may have been influenced by colleagues in the mercantile world, two of whom, Robert B. Folger and Ferdinand Little Wilsey, studied homeopathy and established medical practices after being successfully treated by Dr. Gram in 1826. Bolles, Richard. 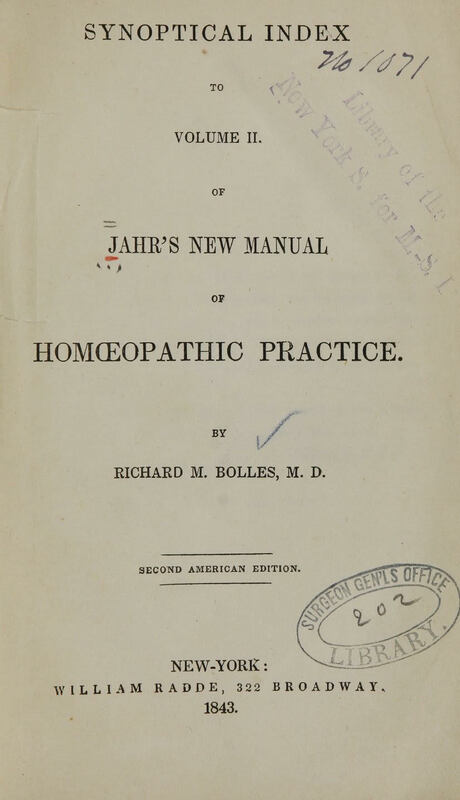 “Synoptical Index to Volume II of Jahr’s New Manual of Homeopathic Practice,” 1843. (Medical Heritage Library. www.archive.org). Whatever his motivation, records indicate that between 1853 and 1865, Seabury relied exclusively on homeopathic physicians. Dr. Richard M. Bolles (1797-1865), made the most frequent house calls to the Tredwell family between 1853 and 1861. He adopted the tenets of homeopathy in 1840, and his practice diminished as a consequence. Bolles remained an advocate of this alternative treatment, and served as president of the Hahnemann Academy of Medicine. He also worked in several of the homeopathic dispensaries in the city. His Poetic Descriptions of the Chest-Pains and their Appropriate Remedies was famous among homeopaths. 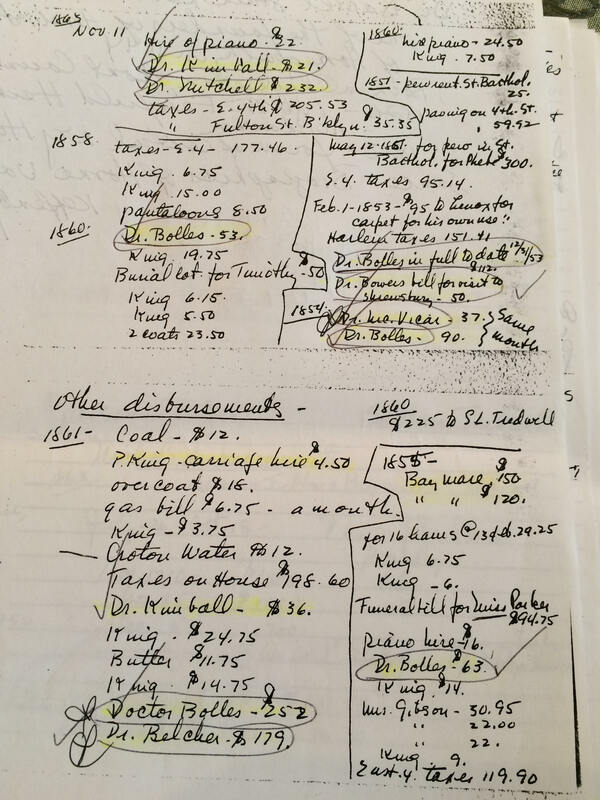 Dr. Bolles’ bills to the Tredwell family over eight years totaled $693. He died in August 1865, five months after the death of his patient, Seabury Tredwell. 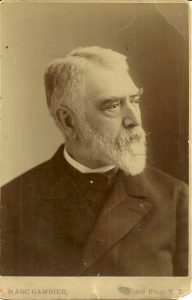 Dr. George Belcher (1818-1890), who ministered to Seabury Tredwell during his final illness in March 1865 (Dr. Bolles having retired some years prior), had one of the largest medical practices in New York City. An 1839 graduate of Columbia College of Physicians and Surgeons, he “converted” to homeopathy in 1844. He signed Seabury Tredwell’s death certificate, listing Bright’s Disease (now nephritis, or kidney disease), as the cause of death. On December 31, 1865, he submitted his bill for $70 for his final visit to the Tredwell home on East 4th Street. After his death in 1865, at least one of Seabury’s children continued to turn to homeopaths for medical treatment. Elizabeth Tredwell Nichols (1821-1880), Seabury’s oldest child, was a patient of Dr. John Samuel Bassett (1830-1912), a Harvard-trained physician with a practice on West 31st Street, near the Nichols’ residence on Fifth Avenue and 34th Street. Dr. Bassett was a highly regarded physician to many of New York City’s most distinguished families, including the Astors, Chandlers, and Rhinelanders. 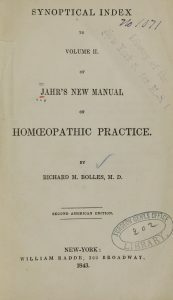 A respected member of the American Institute of Homeopathy, Dr. Bassett was frequently consulted by other physicians because of his skills as a diagnostician. In 1880, he attended Elizabeth in her final struggle with chronic bronchitis. Elizabeth was 59 years old at the time of her death. After the turn of the century, the popularity of homeopathy gradually declined as a result of the increasingly scientific approach and rational treatments of regular medicine. By 1923, only two homeopathic colleges remained in the United States, and by 1950 they too had closed. Within the past 40 years, homeopathic medicine has re-emerged onto the medical scene. It is not unusual for mainstream physicians who focus on a holistic approach to patient care to incorporate homeopathy in their practices, and homeopathic remedies are sold in pharmacies alongside traditional medicine. The Tredwells, no doubt, would feel perfectly at home. Bowers, Benjamin F. “Opposition to Homeopathy in New York,” in The North American Journal of Homeopathy. Vol. 15, May, 1867, p 580-604. http://books.google.com. Accessed 9/26/16. Bradford, Thomas Lindsley. Biographies of Homeopathic Physicians, Vols. 3, 4, 19, 21, 22: Beach-Bixby. Philadelphia, 1916. www.archives.com. Accessed 9/22/16. Brooklyn Daily Eagle. Friday, November 9, 1849. www.newspapers.com. Accessed 9/30/16. Duffy, John. History of Public Health in New York City, 1625-1866, Volume 1. New York: Russell Sage Foundation, 1968. p. 464-471. “Homeopathic Directory.” New England Medical Gazette. April, 1871, p. 190-191. www.archive.org. Accessed 9/8/16. King, William Harvey, Ed. History of Homeopathy and Its Institutions in America. New York: Lewis Publishing Co., 1905. www.archive.org Accessed 9/28/16. Starr, Paul. The Social Transformation of American Medicine. New York: Basic, 1982. Ullman, Dana. A Condensed History of Homeopathy. www.homeopathic.com. Accessed 2/28/16.